San Pedro is a micro-farm and the La Bastilla Coffee Estate. The estate owns two coffee farms in Nicaragua, La Bastilla in Jinotega and Santa Luz in Matagalpa. Under Markus Fisher who runs the estate and Agronomist, Martin Montero, they have both focussed on the speciality market. The estate is fully independent, and Rainforest Alliance since 2003, using its own resources for every stage of the operation from seed to export container. La Bastilla works closely with F.E.E.R; the Foundation for Rural Education and Entrepreneurship which engages the farms youth to promote quality education. The estate has around 50 permanent staff and up to 500 temporary staff during harvest. Production is 4000 sacks per year. Situated approximately 20 kilometres from Jinotega, the farm is adjacent to the Datanli el Diablo Nature Reserve, an important biological reserve in the Jinotega area. The farm itself covers 311 hectares with 160 hectares under coffee cultivation. The remaining area is mostly primary forest protected by law through its proximity to the nature reserve. This forest area provides La Bastilla with a unique microclimate and sanctuary for a number of plant, animal and bird species. Some land on the estate is dedicated as an agricultural area used by La Bastilla Agricultural Technical School. Opened in 2008, the school trains students in agriculture and eco-tourism. 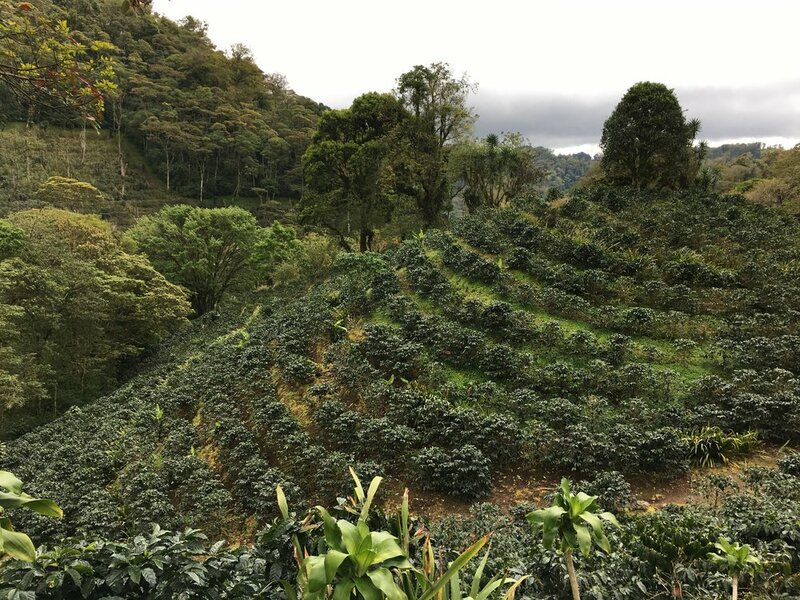 La Bastilla farm has a number of micro-plantations, of which San Pedro is one, at different locations and altitudes that produce some amazing coffees including the wonderful Blueberry Candy which we at HHCo have been roasting. The Blueberry Candy is a super small microlot, grown on the west facing slopes in volcanic soil at the top of the collection of farms within the estate, the cherries are picked by hand as very ripe, before drying at a consistent low temperature to create the fruity characteristics. The H3 varietal was planted here in 2015, and is a cross between Caturra and an Ethiopian landrace accession specifically suited for growing above 1300masl. Produced as part of the first wave of F1 hybrid varieties, H3 does still have some susceptibility to rust but has maintained presence in the fields due to its exceptional cup quality. This is a happy outcome as not all hybrids bred for disease resistance necessarily lead to outstanding flavour profiles. As roasters, looking out for these new developments and pioneering approaches which are resulting in such an outstanding flavours, is at the heart of how we work. The cup has a delicate acidity of alpine strawberries, peanut butter cup aroma and extraordinary blueberry notes, drawn from its Ethiopian parents. Finally, a well-balanced mouthfeel and almond finish. This is a thoroughbred coffee from the same farm that has won several Nicaraguan Cup of Excellence awards - definitely one to watch out for. We love this farm in particular for its commitment to education. In 2003 they founded a small school for the children of their employees, with 2 primary school teachers, as the closest official school was 6 kilometres away. Little by little the farm’s neighbours became interested in a formal education and when they conducted a survey there was a demand to send 165 children to the school. Together with the Jacobs Foundation from Switzerland, La Bastilla entered into an agreement with the Ministry of Education in Nicaragua and built a new school. Today there are more than 200 students from pre-school, primary through to secondary school. As a second phase, to achieve a greater value of rural education, an agricultural technical school was formed in 2008. Starting off with 40 students in 2009, with the aim of offering a technical education in Agriculture and Eco-tourism, in 2017 year they now have 58 students.